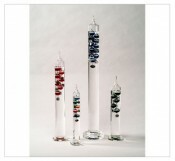 The Galileo thermometer shows the temperature by the movement of the spheres rising and falling in the column. As the ambient temperature rises, spheres descend one by one and those above ambient temperature are left floating at the top of the fluid. The actual temperature, indicated by a numbered medallion hanging from the bottom of each sphere, is that of the lowest sphere still floating. These thermometers are available with a range of different coloured spheres.